This guide will explain some basic concepts about weapons. How damage calculated? What is the difference between different weapon types? You may notice that same sword equipped by different characters deals different damage! Let's look closely at some weapon. Number after skull is damage multiplier - 1.4 in our case. 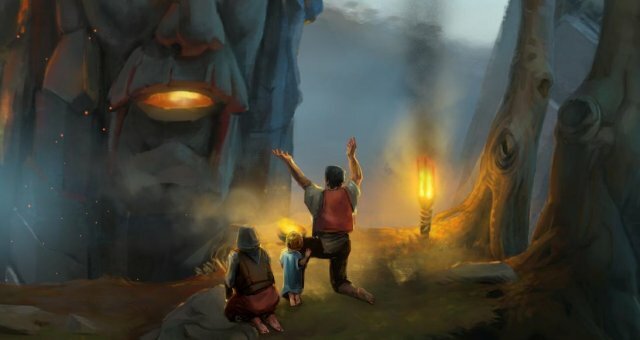 It is applied to the attribute linked to the skill. For most basic melee weapons this attribute is Strength. 9.8 is damage - you see in brackets after multiplier. Try to give this weapon do different characters and you'll see that number in brackets changes (if characters has different Strength). As you can see - the rule is simple. The higher the multiplier the higher the damage. Higher quality items usually have higher multiplier. Do you see this small "+" after skull? This changes formula completely. Instead of multiplier - you'll get an addition. Attibute (Strength) is still applied but to very small extent. 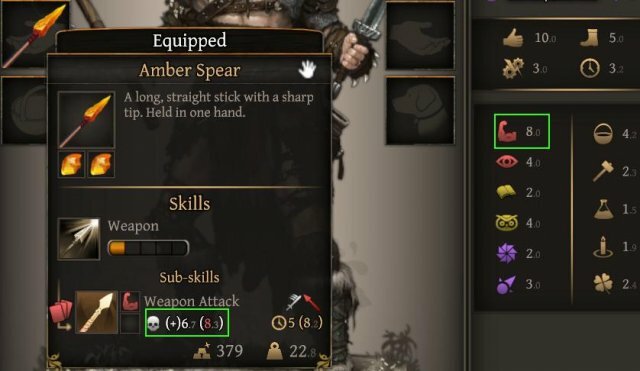 Those weapons can be very useful for characters with small attribute linked to the item. Your mage can now poke enemies with this Amber Spear and do some decent damage! But damage is not everything! Another important aspect of the skill (weapon) is Delay. All cards act in battle based on the delay. Some weapons are faster then other so you may kill you opponents before they can even hit you. Each weapon has its own delay (in this case it is 3.5) and each character has its delay, based on Wits (in this case 3.2). 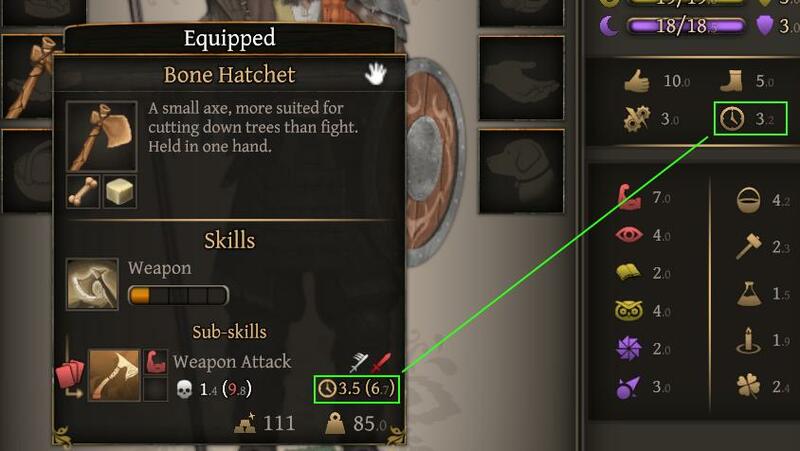 Final delay for this skill (weapon) in the battle is a sum of item delay and character delay (3.5 + 3.2 = 6.7) - you see it in brackets. They both melee weapons, which means you'll need to put your card in FIRST ROW to use it. One-handed and Tho-handed swords have some important differences, so I'll explain them separately. Swords have a passive ability - Shielding. They provide shield in the challenges. It is a renewale protection that is expended before hit points. One handed swords have the HIGHEST SPEED in the game and the LOWEST DAMAGE multiplier. One-handed sword can hit only one enemy - the closest one. Advice - use it by your tanks in early game when you don't have much armor. Also it allows you to have a shield to further increase tankiness. Similar to one-handed swords, greatswords provide some shielding, but one-handed sword + shield would provide more. Greatswords have HIGH SPEED and MEDIUM DAMAGE multiplier. Their main feature is attack pattern. Due to high speed and this splash damage your warrior can wipe out narrow battlefields before enemies can act. Note that splash damage (by default) deals 50% of original damage. Some mid-late game weapons can change that. These are slow weapons with T-Shape attack. That makes hammers a good AOE. This is how works. Warrior will deal 10 damage to the Boar and 5 damage to each adjanced card (if there will be). One-handed clubs have the LOWEST DAMAGE multiplier (just like one-handed swords), but Two-handed mauls have HIGH DAMAGE multiplier. Their only drawback is speed. They both have SLOW speed. Axes have the HIGHEST DAMAGE and FAST SPEED in the game. So what is the drawback? Why not use it all the time? It all about damage mode. Single melee only. Playing with axe (especially 2-handed) might require you to have a good armor for protection. Also it might be a good idea to put your axemen after enemy placed some glass cannon at their front line, so your damage potential won't be wasted on some meat shield. 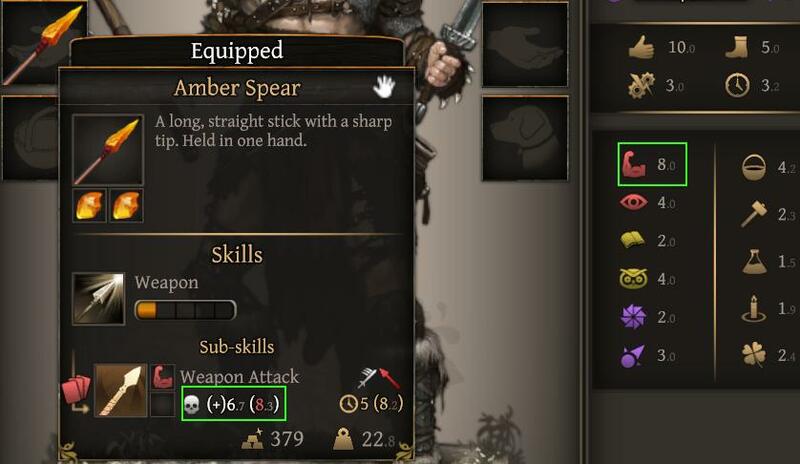 Spears have LOW DAMAGE multiplier and MEDIUM SPEED. Polearms have HIGH DAMAGE and LOW SPEED. They have two main advantages over other weapons. 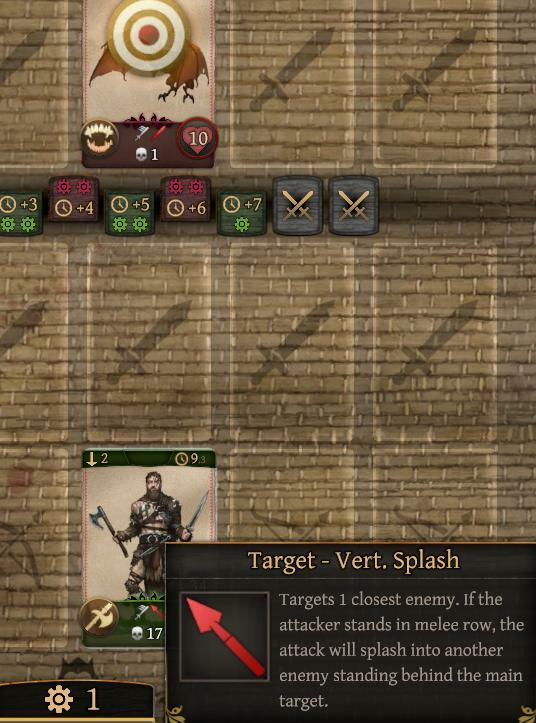 Vertical splash allows you to hit enemies at the back line. 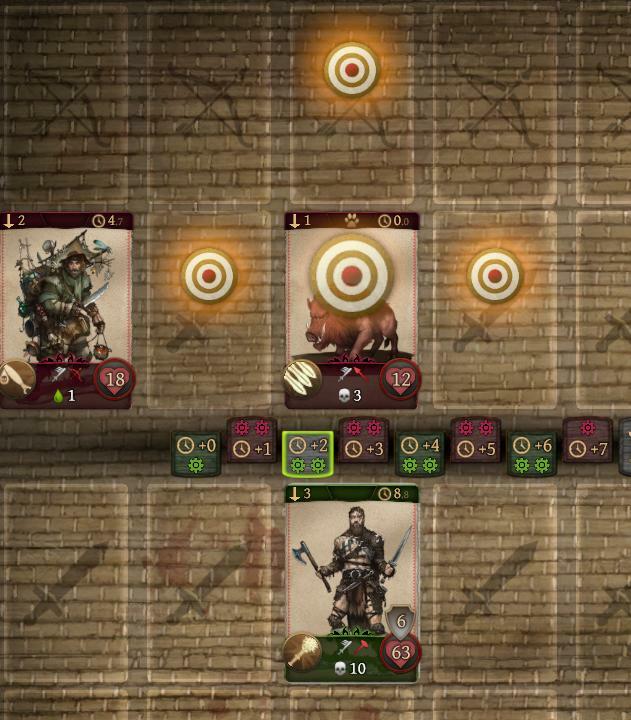 Ability to put a card into SECOND ROW (non-melee) allows your wounded warriors still deal decent damage while staying in relative safety. There are 3 types of weapons in this category: Bows, Wands and Javelins. All of them allow you to put card at the SECOND ROW of the battefield - behind your melee characters. In other aspects those 3 types are quite different. Unlike basic melee weapons, bows scale with Perception instead of Strength. Give it to your Hunter or Gatherer - they usually have good Perception. Bows have LOWEST DAMAGE multiplier and LOW SPEED. But cool part about them - you can aim if there is no one in front of you. Note: Crossbows are no different to Bows from game mechanic point of view. If you'll try to craft a bow from metal - you'll get a crossbow. They also scale with perception, but oh boy they hit hard! Javelins have HIGH DAMAGE multiplier and the SLOWEST SPEED. Their main drawback - they are not really "ranged" weapons. And here comes fun part! 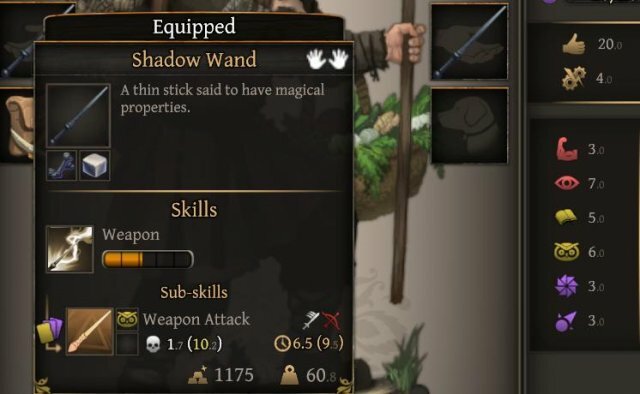 If you hover mouse over wand you see that description is changing between two options. Also you may notice that cards icon is different. If you remember beginning of this guide, I mentioned that there are 3 challenge types in Thea 2 (in fact there are 6, but let's keep it simple for now). There are Physical (RED), Mental (YELLOW) and Spiritual (PURPLE). All other basic weapons we discussed so far can only be used in Physical (RED) challenges. And you'll see RED card icons next to corresponding skill. Wands can be used ONLY in YELLOW and PURPLE challenges. And what is more importantly - different attributes will be used to scale damage in those challenges! As you can see - in YELLOW challenges damage will be scaled from Wisdom and in PURPLE damage will be scaled from Destiny. It is very important to understand that your mages wearing basic wands will be useless in RED fights. Wands have AVERAGE DAMAGE multiplier and the LOW SPEED. Just like bows, wands are ranged weapons that will allow you to choose you targets sometimes.